Ever since the construction began on what used to be the private parking lot at 52 Mulberry St. the community has been wondering "what is going up on that spot"? Well, now that the owners, Marly Corp., have hoisted their banner on the glass clad building we know - it's a hotel. Marly corp. bought all three adjacent properties (46-52 Mulberry), opened the hugely successful Mama's cafe in one of the them, and YoBerry frozen yogurt in another in preparation for the hotel which was the last piece in the puzzle. 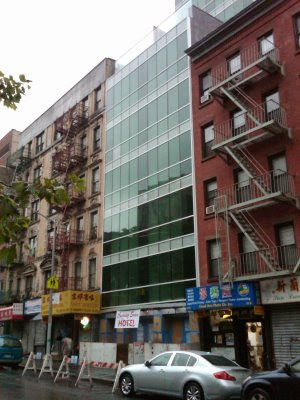 Marly corp. owns several retail hardware stores, construction supply businesses, and a contracting company (or two) in Brooklyn and Manhattan. UPDATE: Curbed.com has listed this posting on their own blog. curbed.com according the NY Times receives 2 million hits per month.